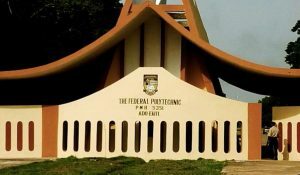 The Federal Polytechnic, Ado Ekiti, on Friday warned that the school will not spare any student caught in the act of cultism, saying that anyone found wanting would be sent to jail. While addressing the freshmen at the matriculation ceremony, the Rector of the Polytechnic, Dr Taiwo Akande, added that henceforth, the institution would no longer condone any act of illegality, including cyber-crime, cultism and illegal sale of bed spaces by students. Akande advised the students against taking steps that could alter the academic calendar, reminding them that doing so may prolong their stay in the institution and affect their lives generally. “It is most disturbing these days to discover that any students sell their bed spaces at exorbitant amounts to fellow students after being allocated bed spaces in the hostel. If detected such students would be not only be rusticated he will be prosecuted as well,” she warned. She, however, urged the students to be security conscious.